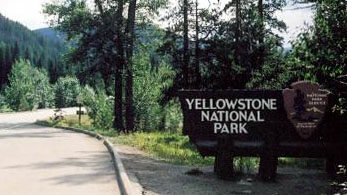 The east entrance of Yellowstone National Park has been served by a US route since 1926 - the year federal highways were first commissioned. Then (as today), US 20 began in Boston, but its west end was at Yellowstone. In 1940 the US 20 designation was extended to the west coast at Newport OR via an implied route through Yellowstone... but technically, since there are no US routes within the Park boundaries, there are two separate segments of US 20: one on each side of Yellowstone. So in other words, the east entrance still marks the west end of the east leg of US 20. 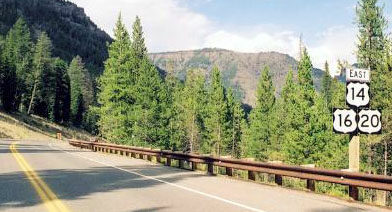 Meanwhile, in about 1938, the US 14 designation was co-signed with US 20 west from Cody WY to Yellowstone's east entrance. And in 1965, the US 16 designation was extended too: co-signed with US 20 west from Worland. ...although US 20 has an implied route through the Park to West Yellowstone, where it resumes again (more info on the West Yellowstone page). last updated Mar. 30, 2016.